The Lehigh Valley IronPigs will celebrate Hispanic Heritage during three games at Coca-Cola Park this season. The Pigs' Sunday, April 28, Wednesday, June 5 and Thursday, August 1 contests will be Hispanic Heritage Celebrations presented by La Mega Radio. 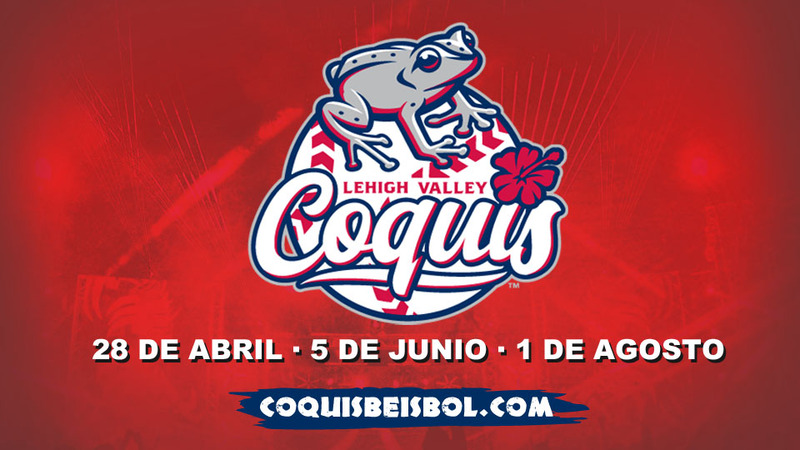 During each of those three games, the team will become the "Lehigh Valley Coquis." The Coqui is a small frog native to Puerto Rico, and a national symbol of pride for Puerto Ricans. The Coqui is a symbol of Puerto Rican heritage (similar to the bald eagle's status in the United States). Each night across Puerto Rico, the familiar mating call of Coquis can be heard. The symbol serves to better connect the IronPigs with their local community (approximately 80 percent of Allentown's Hispanic population and 90 percent of Bethlehem's is of Puerto Rican descent). A popular refrain from people of Puerto Rican descent is "Soy de aquí como el Coqui" which roughly translates to "I'm from here like the Coqui" or "I'm as Puerto Rican as a Coqui." The local community reached out to the IronPigs to voice their support of the "Coquis." Local artist, Max Meano Torres created the Coqui logo and marks and incorporated both IronPigs elements as well as traditional elements of Puerto Rico including the amapola flower. In addition to the new logo and identity, the Pigs will have new food, music and giveaways available during this season's three Hispanic Heritage contests. Tickets and merchandise for the three games are available for purchase at CoquisBeisbol.com. Kids 17 and under on Sunday, April 28 will receive "Coqui Frog Socks" presented by United States Cold Storage. There will be a "Coqui Cap" giveaway for kids 17 and under on Wednesday, June 5 presented by Nazareth Pallet. The IronPigs will wear "Coquis" caps and jerseys. A jersey auction and cap raffle both take place during the final Hispanic Heritage game (August 1). Tickets for the raffle can only be purchased at the August 1 game. "Coquis" New Era Caps and "Coquis" style t-shirts are available for purchase at CoquisBeisbol.com and ShopIronPigs.com. The IronPigs celebration will include Hispanic-themed music, entertainment and food options. Arroz con Gandules and Pernil platters will be available on the concourse, as well as Chicken with Tostones, Pinchos de Cerdo and Pollo, Pastelillos, Empanadillas and other food items. The IronPigs are one of 72 minor league teams sporting Hispanic Heritage caps and jerseys this season. According to the U.S. Census Bureau, nearly one-quarter of the Lehigh Valley's population identifies as Hispanic or Latino. Minor League Baseball's U.S. Hispanic/Latino fan engagement initiative, "Copa de la Diversión" established an innovative new platform authentically connecting MiLB teams with their diverse communities, embracing the culture and values that resonate most with Hispanics/Latinos nationwide. Proceeds from the jersey auction and cap raffle will benefit the Fe Foundation, which delivers educational community development programs of the Hispanic Chamber of Commerce of the Lehigh Valley and IronPigs Charities, which provides educational and recreational opportunities for Lehigh Valley youth. The 2019 IronPigs season is the team's 12th as the top affiliate for the Philadelphia Phillies and 12th at Coca-Cola Park. Follow the IronPigs on Twitter at @IronPigs and like them on Facebook via Facebook.com/LHVIronPigs. The 2019 IronPigs season is presented by Capital BlueCross.